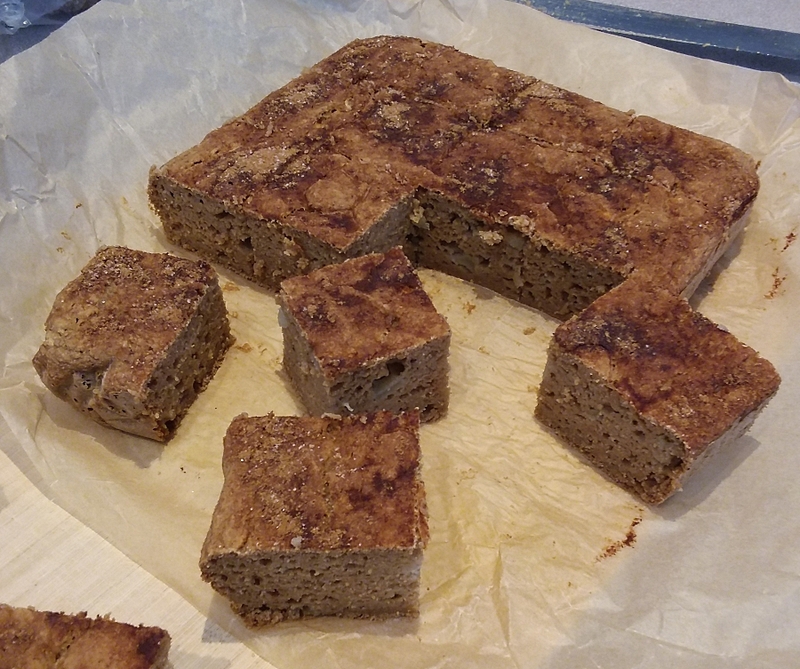 This is another way of cooking my Applesauce Spice Loaf (vegan, low-fat). I like this better. 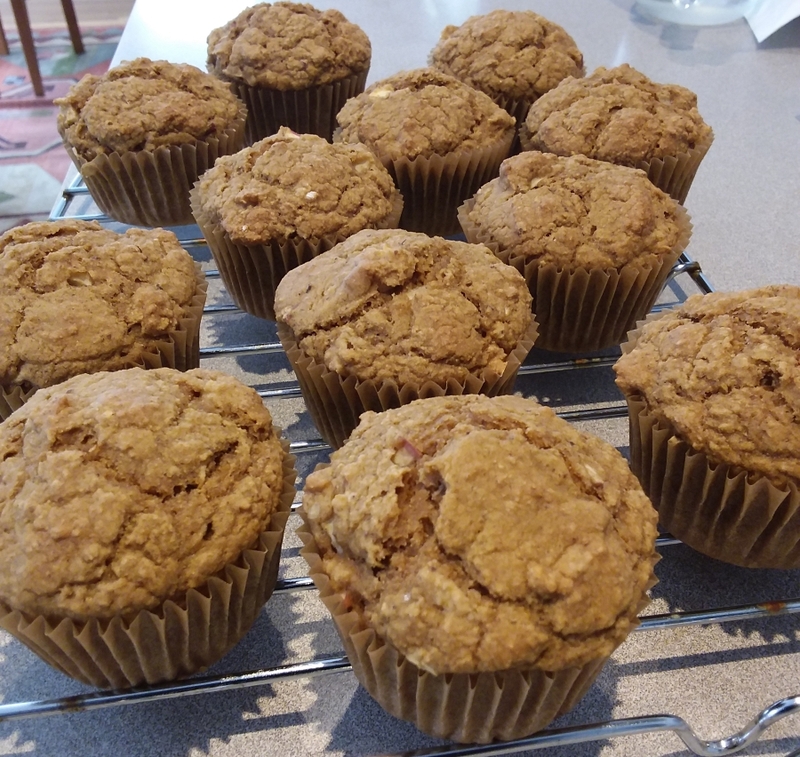 I made some minor tweaks to the recipe but the biggest change is that sweetened cinnamon topping. It’s amazing what a small change can do. 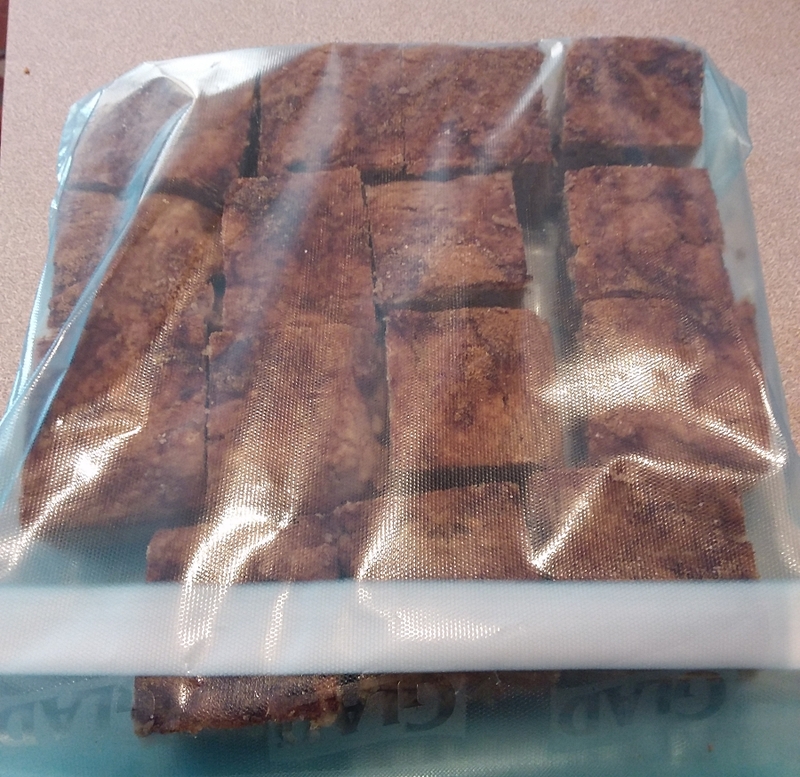 Preheat oven to 350 degrees F. Cut a piece of parchment paper to fit the bottom and sides of an 8×8 inch square pan. Place the parchment-lined pan into the oven to preheat. Mix cinnamon and sugar topping. Set aside. In another large bowl combine applesauce, almond milk, maple syrup, vinegar, and flax mixture. Whisk until blended. Remove pan from oven and place on hob or trivet. Add wet to dry. Stir just until you see no dry flour. Don’t over-blend. Fold in apple pieces. Pour batter into pan and spread evenly. Sprinkle topping. This recipe also makes good muffins. The only thing that changes is the oven temperature and cooking time. I set it high, 400 or I might try 420 next time, and bake for 8 minutes then turn the temperature down to 375 for an additional 16 minutes (24 minutes total cooking time). The oven probably won’t recover in those 8 minutes but that’s OK, it will still be hot enough to give the muffins a nice oven spring. This entry was posted in Uncategorized on March 8, 2019 by Bix. You may have to turn the sound up on the little speaker icon on the player. Mine was muted. I’m not used to posting Facebook videos. This entry was posted in Uncategorized on March 4, 2019 by Bix. To the eyes of a bird, humans must move like a plant. In the very beginning of this video, Dr. McGill* is using a simulator to create a disc herniation by merely flexing and bending a spine repeatedly, in a movement that resembles a sit-up. The rest of the video shows how to perform his 3 basic exercises for strengthening the abdominal muscles without injuring the back (modified curl-up, bird dog, side plank). Here he is discussing myths about exercise. Did you know that sucking in your stomach is harmful? It can cause the spine to buckle (a sideways deflection). He says that a flexible back or a strong back are not protective of back injury. In fact, they are associated with more injury. The muscles of the back are meant to stabilize, to prevent movement. This is true for abdominal muscles and others of the core or torso. However, since back and stomach muscles are in constant use, they need to be maintained to provide endurance. What I am learning – over the years! because this just isn’t sinking in – is that repetitive motion is not your friend, especially if it is done with weights. It damages wrists, elbows, necks, knees, and backs. The above three exercises are low-impact and non-repetitive. * Dr. Stuart McGill is a professor emeritus at the University of Waterloo where he taught for 32 years. His research involved how the back functions, how it becomes injured, how to prevent injury, how to rehabilitate an injured back, and how to enhance athletic performance. His clients include professional athletes. He currently serves on the editorial boards for the journals Clinical Biomechanics, Applied Biomechanics, and Spine, and is the author of several books. This entry was posted in Uncategorized on March 3, 2019 by Bix. I saw this map and I thought these figures were high. Source for map. Source for data. I live in Pennsylvania. The median household income for Pennsylvania, before-taxes, was $59,195 in 2017. Employees are subject to payroll taxes at the federal, state and local levels. The standard federal payroll taxes apply to residents of all states. This includes federal withholding tax based on the employee’s W-4; Social Security tax, which is calculated as 6.2 percent of wages, and subject to a wage ceiling; and Medicare tax, which is calculated at 1.45 percent of wages, without a wage ceiling. At the Pennsylvania state level, an employee is subject to two payroll taxes: Pennsylvania state withholding at a flat 3.07 percent of wages, and the Pennsylvania unemployment tax at a flat 0.06 percent of wages. At the local level, the payroll withholding tax depends upon the employee’s residency and the jurisdiction of his or her employer. For example, a resident of Philadelphia who works in Philadelphia will have local withholding tax of 3.8907 percent; whereas a resident of a Bucks County suburb who works in Bucks County may have a local withholding rate between 0.5 percent and 1.0 percent. Based on the two aforementioned examples, a Philadelphia-based resident and employee making $70,000, who falls in the 15 percent federal tax bracket, will have about $20,800 withheld in taxes. An employee fitting the same criteria but living and working in a Bucks County suburb, will have about $18,800 withheld in taxes. That’s about 30%. This next source says 31.3%. There are a lot of variations in these numbers! But if I apply a gross 30% tax burden to that PA median household income of $59,195 I get $41,436. The average or median take-home pay in PA is about $41,436. 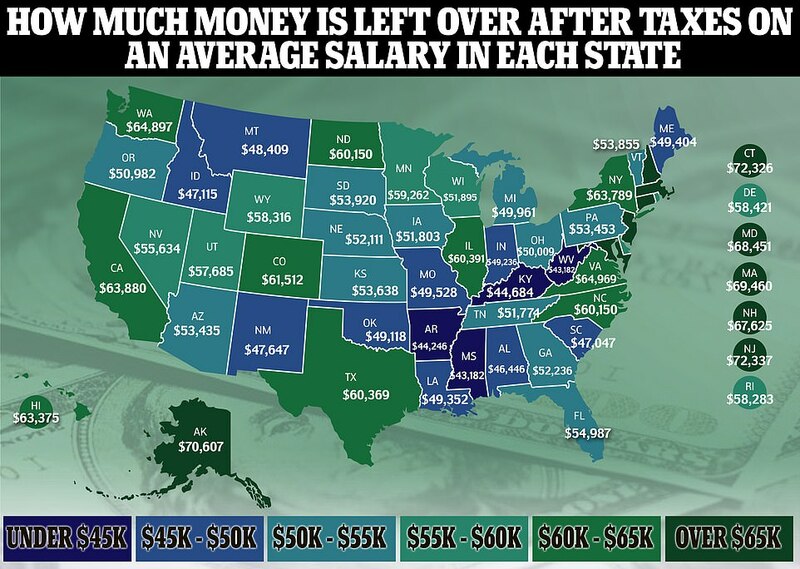 That’s quite a bit lower than the $53,453 in the map above. It’s also not a lot of money to live on when you consider the skyrocketing costs of healthcare, housing, education, and transportation. This entry was posted in Uncategorized on March 2, 2019 by Bix. If we want a healthy body, we can eat well and exercise. If we want a healthy mind, well-being, we can likewise learn and apply techniques that foster it. Mental health, like physical health, doesn’t just happen on its own. It needs our attention. I have been researching meditation and mindfulness. A lot of what I learned years ago has come flooding back, both the knowledge and how it feels in my body. A lot has changed. The science is better. Here’s Jon Kabat-Zinn describing the benefits of meditation and mindfulness with a scientific angle that appeals to me. I must say, there is a lot of hocus-pocus online about meditation. It’s not about holding your body in some particular way, your fingers just so. It’s not about emptying your mind. It’s not about breathing a certain way. All of these things can be helpful but none of them are required. This entry was posted in Uncategorized on February 26, 2019 by Bix. Diet composition in Cuba also changed during the study period. By 1993, carbohydrate, fat, and protein contributed 77 percent, 13 percent, and 10 percent of total energy, respectively, whereas in 1980 their respective contributions were 65 percent, 20 percent, and 15 percent. The primary sources of energy during the crisis were sugar cane and rice. This entry was posted in Uncategorized on February 23, 2019 by Bix.